For visitors interested in unique wildlife experiences, the park is a convenient home for classic big game and the ten primate species plus other Big cats. The park is proud of an amazing big crowd of 5000 hippos, 2500 elephants and over 10,000 buffalo all supported in its grasslands and shorelines. Queen Elizabeth national park Guarantee’s visitors’ on Uganda wildlife Safaris an opportunity to encounter some of Africa’s most iconic or outstanding wildlife species. Hearing the elephants’ calls reverberate around Queen’s crater-filled valleys is a magical experience. The other park residents include warthogs, Uganda kob, waterbuck, and topi, as well as the sitatunga antelope. In Queen one can’t talk about wildlife without proving the existence of the big cat species such as felines: lion, civet, leopard, genal and serval cats that are mainly seen in the night game drives or very early morning game drives. The king of the Jungle (Lions) are easily confronted in various sections of the park, but the most cherished being the tree climbing lions thriving in the remote Ishasha southern sector of Queen Elizabeth national Park, where they tend to rest on the limbs of fig trees. Visitors on Uganda safaris to Queen Elizabeth national park also have the chance to encounter the solitary leopards which are so fascinating to watch when they are roaming in their natural environment. The smaller cats are also predominantly nocturnal and best spotted on night game drives. The wide-range of the natural habitat in the park is also favoring the survival of ten (10) primate species including the human closest brothers -the chimpanzee as well as the baboons, and Vervet monkeys black-and-white colobus monkeys though not easily seen. Most of these exclusive primates can be encountered on chimpanzee trekking experience in Kyambura gorge of Queen Elizabeth national Park. 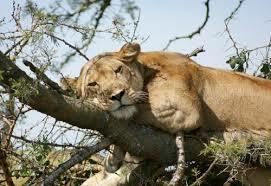 In nut shell, a game drive safari to Uganda without Queen Elizabeth national park is an incomplete safari. The park offers the most fascinating and rewarding drives in Uganda .These are mainly done in the two areas namely the Channel Drive Circuit and the Kasenyi Plains.